Here is another found item heading toward a drainage ditch. It is an orange ball larger than a ping pong ball, but much smaller than a baseball. It is very lightweight, and I suspect hollow. I did not slice into it before I removed it from the street and tossed it into the trash. I just did not want to send another plastic item into the water supply. A green sea turtle dubbed Kermit, rescued from the surf in Sandbridge by a swimmer last month, is being treated for obstructions in his throat including a rubber band, a balloon, pieces of plastic and a Spanish language newspaper. A swimmer found Kermit floating upside down in the water near Sandbrige on September 20. Since then the Virginia Aquarium has been treating the turtle, who was thin, lethargic and dehydrated. Last week doctors at the Beach Pet Hospital found and removed a number of foreign objects from Kermit’s throat, thought to be trash ingested at sea. Doctors are monitoring Kermit’s condition. I wish Kermit a speedy recovery. This is why we shouldn’t throw trash on the ground or in the water. Tomorrow marks the first anniversary of PlanetTrash: The Earth is Not a Trash Can. This image started the blog. When we spotted this overturned jaccuzi abandoned on the side of Newsom Station Road, something stirred us to fight the litter accumulating around our home. A few weeks ago, I wrote about how my life had changed since this blog became a reality. We will continue to fight litter and especially plastic litter. Our (meaning you, everyone in the world and me) dilemma is handling the plastic trash that we use in our everyday life. Plastic is everywhere. We can’t live without it. 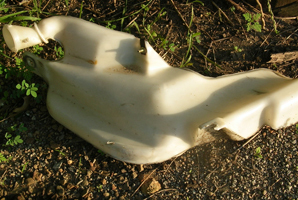 Look around you and try to find something that isn’t made of plastic. We can reduce the amount of unneeded plastic as cups, plates and flatware. What do we do with our computer and other electronic components, automobile parts, etc? From just home and office use, I’ve used at least a dozen computers in my life. How many are in landfills? Worse, how many are floating in the Great Pacific Garbage Patch? Everything we buy is enclosed in plastic or is put into a plastic bag. Why? Refuse to take plastic. Reuse or recycle it if you do. If you can’t, put it into a trash can at the least. Just don’t use Planet Earth as a trash can. Please! At first, I thought that this was chocolate. It’s Middleton’s New! 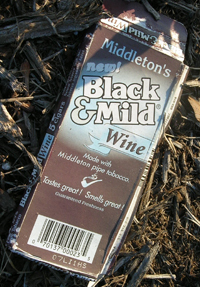 Black and Mild Wine. What? Made with Middleton pipe tobacco. Tastes great! Smells great! I’m confused? Is it wine? Tobacco? Isn’t that cancer-causing substance illegal yet? This is actually little cigars with a plastic mouthpiece. Is the mouthpiece to keep your lipstick from smearing all over the cigar? This is not only bad for your internal health, this product is bad for the environment. 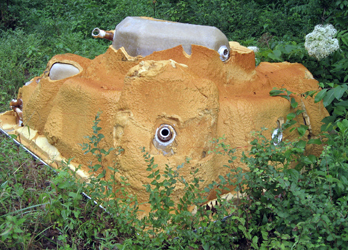 This is a tank from a car or other vehicle. It was probably used for antifreeze or window cleaner. Now, it’s residing on the Branstetter property, although there is a No Dumping sign less than 10 feet away. How does one car part make its way to a secluded country road? And why does one car part make its way to a secluded country road?